"Angry Birds", the game by Rovio Mobile, burst on the scene in early 2009. It now has millions of addicted devotees all around the world. Click to view the auction! Most of the planet Earth knows how this game works, but in case you've been on the far side of the Moon for a while, it goes like this; evil pigs have stolen the birds eggs for food. This has made the birds very angry. How the birds get their revenge is by sling-shotting into the pig's poorly constructed shelters where they are hiding, with the hope of destroying the shelter and the pigs themselves. When the pigs are destroyed you move onto another level, with more elaborate pig shelters and different birds. I love playing this game, the birds are very cute, they make cute sounds, and they really seem to like being hurled at the pigs. However, I'm starting to hate those pigs, especially when you've used up all your birds, and there's still a pig sitting there safe and he's making a "heh heh" sound. ARRRRG! So behold! 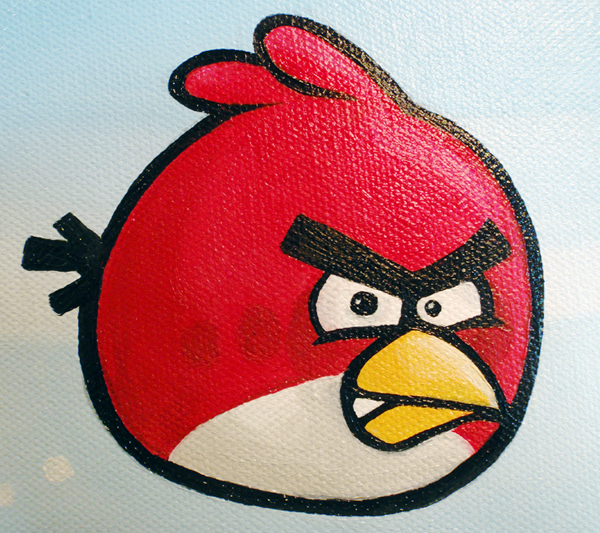 I've captured the bird's angry little face in paint, for eternity, much like the Mona Lisa's smile. He's a symbol of strength, determination, and sacrifice, for he will fight for his family even if it means the feathers will fly and he is flung onto a slab of wood, glass, or stone. "Red Bird" the painting, stands as an inspiration to do your best against all naysayers and bullies and emerge triumphant! Don't let the pigs of this world get away with stealing what's rightfully yours. Go out and sock it 'em with all you got! Fly into that great blue yonder, and control your own destiny! 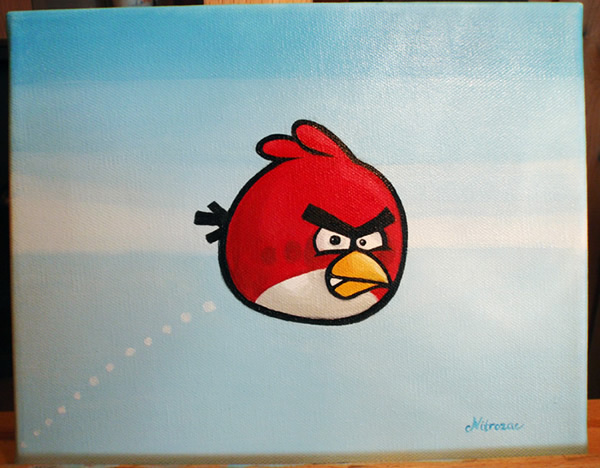 Everytime the future owner of this painting looks at "Red Bird" it's my hope that it lifts their spirits and brings a smile across their face and inspires them to release their inner "Red Bird". Details: "Red Bird" original painting, on 8 x 10 inch stretched canvas, with a wooden frame. The painting is about a half inch thick, with painted sides, so you can frame it if you wish, or display it as is. The back of the painting contains the title, the date painted, Nitrozac's signature, and a fingerprint for authenticity. Best of luck to all bidders, and to the winner, I know you will adore this painting as much as I do. Shipping for each painting is extra... to the US and Canada via airmail it is 25 dollars, to other locations, 35 dollars. If the buyer is located in Canada, I will have to charge the appropriate HST Canadian taxes.